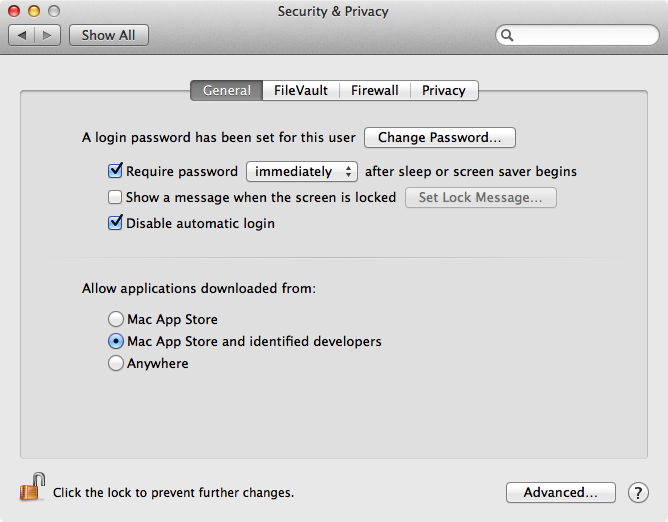 Upgrade to Indigo 5.1.5 or newer for Mountain Lion compatibility. When you run the FTDI driver installer (used by most PowerLincs and other USB devices), it installs only the driver for the mode your CPU is in. In Snow Leopard, that was 32-bit (although you could manually switch it to 64-bit and Snow Leopard Server was also 64-bit). In both Lion and Mountain Lion, all systems are 64-bit. The end result is that if you are upgrading from Snow Leopard to Lion or Mountain Lion you will probably need to reinstall the FTDI driver before the Mac can communicate with the PowerLinc. You should download the latest driver from FTDI and run its installer to make sure the most recent version of the driver is installed. If you are using the Auto start Indigo Server on user login option inside the Start Local Server dialog then you may notice that on restarting your Mac, Indigo Server takes a while to launch. Apparently the startup process of Mountain Lion has changed, and the recommended mechanism Indigo Server uses to auto-start itself is now given a much lower priority. Once your Mac has restarted and is idle, it can take up to another minute or so before the OS launches Indigo Server. But it will eventually be launched by the OS. Users running Indigo 4.x may have issues including the inability to run the installer (see below for workaround), and problems sending AppleScript commands to the Indigo Server from external scripts or other applications. Therefore, we recommend upgrading to Indigo 6 if you are using OS X 10.8. Note although we discuss below how to workaround the known Mountain Lion incompatibilities, Indigo 4.1 support officially ended on 7/31/2012. 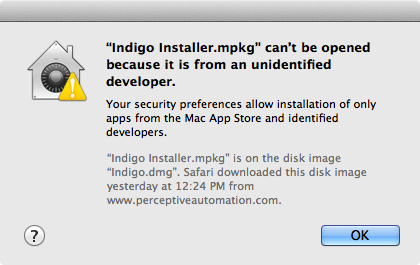 Indigo 5.1.4 and prior versions of the Indigo installer aren't signed. Also, several of the drivers that various USB hardware use (the FTDI driver, etc.) are also unsigned. So, to successfully run these installers you'll need to temporarily change the security setting to Anywhere before you run those installers. Please don't be alarmed - this setting is identical to how it was in all previous versions of Mac OS X. Once you've successfully installed the software, you can change the setting back to one of the more restrictive settings. In Indigo 4.x (we've worked around this problem in Indigo 5.1.5) external AppleScripts that need to talk to the Indigo server will not work. A potential workaround is to uncheck the Auto start Indigo Server on user login checkbox in the Start Local Server dialog. Next, stop the server from the Indigo client if it's running. Then relaunch it either by double-clicking or running an AppleScript that talks to Indigo. You may also be able to add the IndigoServer to the Login Items in the system preferences. See the Indigo 5 section above for additional notes on upgrading to Mountain Lion.